"It has been the honor of a lifetime," outgoing U.S. Ambassador to the U.N., Nikki Haley said Tuesday. "It has really been a blessing." Trump praised Haley, saying she has done an "incredible job" and is "somebody who gets it." He said he hoped she would come back to the administration in another capacity, adding, "You can have your pick." "It has been the honor of a lifetime," Haley said. "It has really been a blessing." She thanked the president, as well as first lady Melania Trump and the president's daughter Ivanka Trump and son-in-law Jared Kushner, whom she singled out as a "hidden genius" who had done significant behind-the-scenes work. Trump says he will name Haley's successor in the coming weeks. Speaking to reporters on Tuesday afternoon, he named Dina Powell as one person in consideration for the role. Powell was deputy national security adviser under H.R. McMaster before leaving the administration earlier this year. The president was asked whether he was considering nominating Ivanka Trump for the U.N. post. Trump replied that she would be "dynamite" in the job, but he was concerned about being accused of nepotism. Trump nominated Haley to the U.N. job in November 2016. The Senate confirmed her to the post in January 2017 by a vote of 96-4. 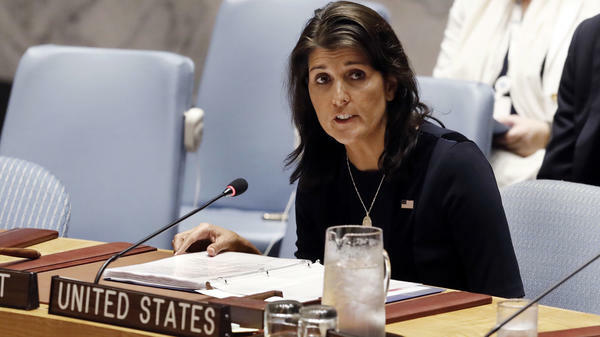 Haley, the former governor of South Carolina, has been a fierce advocate for Trump's policies at the U.N. She said Tuesday that in the past two years, the U.S. had become respected on the world stage, if not necessarily liked. She cited U.S. action on Syrian chemical weapons, trade deals, the arms embargo in South Sudan, U.N. sanctions against North Korea, the withdrawal from the Iran nuclear deal, and the relocation of the U.S. Embassy in Israel to Jerusalem. Israeli Prime Minister Benjamin Netanyahu thanked Haley in a statement for her support of Israel, saying she "led an uncompromising fight against the United Nations' hypocrisy and for truth and justice in our country." Haley said she is not running for the presidency in 2020 and plans to campaign for Trump. She did not say what she will do next, except that it will be in the private sector, according to her letter of resignation. "I proudly serve in this administration, and I enthusiastically support most of its decisions and the direction it is taking the country," Haley wrote in The Washington Post last month after an anonymous op-ed was published in The New York Times criticizing the Trump administration. "But I don't agree with the president on everything." On Monday, the federal watchdog group Citizens for Responsibility and Ethics in Washington called for the State Department's inspector general to launch an ethics investigation into Haley regarding seven free flights on private planes that Haley and her husband accepted from three South Carolina businessmen in 2017. "Ambassador Haley should have been conscious of the appearance concerns surrounding her acceptance of gifts of private luxury air travel at a time when her colleagues in the administration were making news with their own lavish air travel," CREW wrote. On Tuesday, U.N. Secretary-General Antonio Guterres thanked Haley for her "excellent cooperation and support," his spokesperson told Reuters. "They had a very productive and strong working relationship."